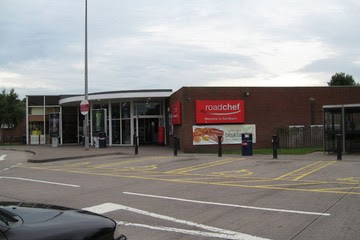 So what do you do at the worst services in the UK ? You turn your bike round, buy a posh coffee, collect the caches, and move on. There isn’t much to say except that all the above activities were achieved with a minimum of fuss. The main danger was overlooking by other punters. Both are in prominent locations. The two there are M6 Sandbach Services Southbound and Motorway Mayhem M6 Sandbach Services Northbound , both by The Bignall Boppers. That’s all there is to say, except that they were done on a day trip to Lytham from Milton Keynes, and Sandbach was the worst location of the three. Hopefully the thumbnail photo sums it up.